A performance bond is used to ensure completion of a building project. 2. What Are Fidelity & Surety Bonds? 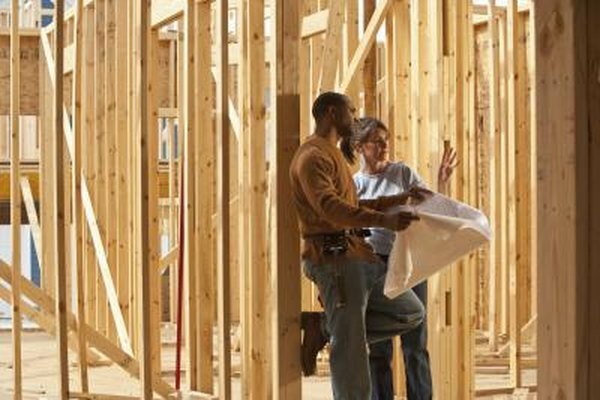 Construction projects such as home building and extensive remodeling are complicated endeavors, particularly if you don't have any previous building experience. You run the risk of causing property damage or failing to complete the project, among other possible complications. More often than not, you should hire an experienced construction contractor to oversee completion of the project. Although your contractor is not immune from these same risks, you can guard against them better through the use of common construction industry practices such as requiring a performance bond and indemnity from your contractor. Several types of surety bonds are used in the construction industry, one of which is a performance bond. A surety bond is an agreement among three parties: a surety company, construction contractor and the obligee -- that is, the person who receives the benefit of the bond. If a performance bond is used on your building project, you are the obligee. In the event that your contractor violates the performance bond agreement, you can file a claim with the surety company to rectify the contractor's violations. For example, say a performance bond guarantees that your contractor will complete your building project as stated in your contract with him. If the contractor abandons the project before completion, the surety company is obligated to pay for another contractor to complete the job. A performance bond is purchased when you forge an agreement with your contractor. It is up to your contractor to find a surety company willing to write a performance bond for your project. An experienced contractor typically has a working relationship with a surety company due to the extensive personal background check that is required to obtain a bond. The surety company charges an annual premium for the bond, which your contractor will most likely include in the agreed-upon price for handling your building project. Upon completion of your project, the performance bond is no longer in effect, and no further premiums are owed. Because performance bonds are not required by law on private projects, the provisions of such bonds can vary among surety companies. The performance bond should be carefully reviewed before signing an agreement with your contractor so that you know your rights under the bond. In the context of a performance bond, an indemnity is an agreement between the surety company and contractor that obligates the contractor to cover any losses suffered by the surety company on the bond. For example, if the surety company must pay another contractor to complete your project, the surety company will make a demand on your contractor under the indemnity that he pay for this expense. The surety company can sue the contractor if he fails to do so. To protect against claims for damage caused by your contractor during your project requires the use of insurance. For example, if your contractor knocks down a tree that falls through the roof of your neighbor's house, you may be sued by your neighbor for the damage, along with your contractor. Neither a performance bond nor an indemnity can help you in this situation. As part of your initial negotiations with your contractor, you should insist that he name you as an additional insured on his general liability insurance policy while working on your project. What Is the Difference Between an ERISA Bond & a Fidelity Bond? When Would a Bond Be Called? Does Homeowner's Insurance Coverage Require a Home Inspection?